Now, torn between conscience and career, the newly minted law partner faces a critical choice: defend the very companies that manufactured the addictive drugs, or give up his fiancée and his hard-won dream job to fight for justice in his sister’s name. Returning to his blue-collar hometown with a ragtag band of law-school misfits by his side, Matt squares off against a team of New York corporate attorneys in a high-stakes courtroom battle. If he wins, the case could have national implications, bringing down the multibillion-dollar Big Pharma industry. If he loses, he’ll become collateral damage in the greatest fall of his career and his life. 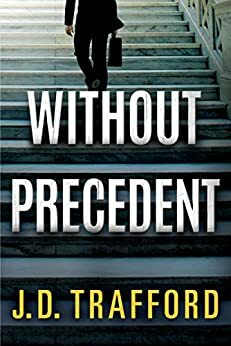 J. D. Trafford, the award-winning author of Good Intentions, has topped numerous Amazon bestseller lists, including reaching #1 on the Legal Thrillers list. IndieReader selected his debut novel, No Time to Run, as a bestselling pick, and Little Boy Lost was an Amazon Charts bestseller. Trafford gradu¬ated with honors from a top-twenty law school and has worked as a civil and criminal prosecutor; as an associate at a large national law firm; and as a nonprofit attorney handling issues related to housing, education, and poverty in communities of color. He lives with his wife and children in the Midwest and bikes whenever possible. For more information on the author, visit www.jdtrafford.com. I was really looking forward to a good court room drama but the book was too predictable and lacking any substance or depth. Disappointing. This is a terrific David and Goliath courtroom drama that kept me on the edge of my seat. (What is more exciting than seeing if a big pharma company can be beaten by a lawyer, a teacher and some kids still in law school?) But it is also a story about how money and power can corrupt the individual and poses the question: Is there some way back from there, or will it be too difficult to resist the temptation of the big bucks? As we journey through the process of the decision to litigate what seems an unwinnable case with Matt Daly, we wonder if in sacrificing everything he thought he wanted, he can find himself and gain a renewed respect for his family which he seemed to have lost long ago. Or will this be just a platform to assuage his feelings of guilt? While the twist at the end seemed a bit contrived to me, it still left me wondering and provided another layer of complexity to the characters. The ending line says it all, "Of course, everything is hypothetical." This is an excellent piece of writing. First, there are just a few too many " what not everyone knows" where the author talks down to all the non-lawyer idiot readers. Second, and the big one, is that in the author's world people just don't take full responsibility for their actions. Sure, corporations are heartless evil things but in the end the person has to take responsibility for what he has done or failed to do. An excellent read, although I did find that for a lawyer he was portrayed a little too 'sweet' and perhaps the love story attached to the plot was somewhat like Mills and Boon. Nevertheless I did purchase more books by the same author and have enjoyed those as well. I was very pleasantly surprised. It was very well written[[ kept my interest throughout and the ending was reasonable. I would highly recommend this novel to everyone. This novel was a compelling page turner. With the opioids crisis raging around us Trafford personalized the realities of addiction in a way that calls the reader to action.